Gravel volume required to fill a path, car park or driveway. Car, truck or van load space volume capacity. Car load volume to move storage. Maximum volume capacity a water tank will hold. How much fuel is required to fill a tank. Size of bund required to contain leaks and spillages from IBC containers. Number of bags required for each material for a building project. Quantity of soil required to fill a planter box. Amount of water required to fill a fish tank/aquarium. Fill capacity for a pond. Warehouse room storage capacity from dimensions. Luggage space possible inside a suitcase. Cement mix required to fill foundations/footings. Pickup truck bed volume capacity. Trough capacity for feeding animals. Garden shed, Sunhouse or Greenhouse cement pad volume. 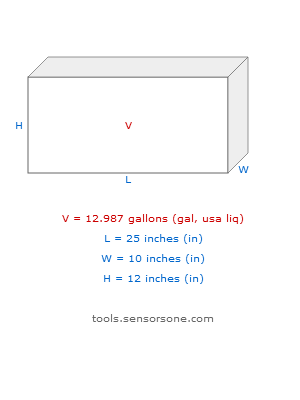 This online tool calculates the volume of a rectangular box from the dimensions of length, width and height. There is no need to input values all in the same measurement units, just select your preferred units for each dimension and calculated volume. Once the measurements have been entered for length, width and height, the calculated volume will be shown in the answer box. Also a graphic of the Volume shape and dimensions will be drawn which will update each time the entered values are altered. Enter the measurement of length, width and height for the rectangular box. This is the volume of the rectangular shaped box which corresponds to the dimensions entered for length, width and height. The volume is calculated by multiplying together each dimension and then converting it into the selected volumetric units. How many US gallons will a 10 inchs wide 12 inchs high and 25 inchs long tank hold? Assuming internal dimensions or no wall thickness, the volume of the tank is 12.987013 US Gallons.